Norwich’s prominence as a centre of provincial art started in the late 18th century, when it became home to a rapidly growing and developing artistic community. There were many professional artists, drawing masters, scene, sign and heraldic painters, framers and gilders. In addition, the city and county as a whole attracted many eminent visiting artists, who found patrons among the county’s wealthy landowners. This artistic activity in the city culminated in the founding of the Norwich Society of Artists by John Crome (“Old Crome”) in 1803. This was the first major provincial school of artists in the country and was the first provincial group to exhibit their work. Four years after its formation, the group was joined by John Sell Cotman, one of Britain’s finest watercolour artists. The society survived for over 30 years and was central to some famous artistic families, including Stark, Ladbrooke and Stannard to name a few. Out of the society also grew the Norwich School of Artists – excelling in landscape art. After the demise of the Norwich Society of Artists there were many calls for facilities for local artists to hold major exhibitions. But it was not until 1885, when Edward Elliot & Robert Bagge Scott met with Charles John Watson, that firm proposals for Norwich Art Circle were developed. The circle rented a room in Old Bank of England Court for holding their meetings and exhibitions, and remained there for ten years. Thus began an artistic group that continues to this day and whose list of members and exhibitors include many of the great artists of early 20th century Britain, including Arnesby Brown, Munnings and Seago. There are so many others, who may not be so well known, but have contributed considerably to the rich tapestry of Norfolk art nonetheless. Landscape artists still dominated, following in the footsteps of their predecessors of the Norwich School. 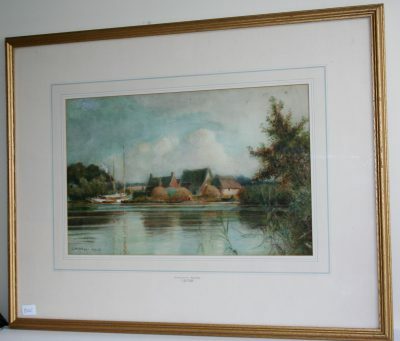 Numerous watercolours of C.H.Harrison (1842-1902), S.J Batcheldor (1849-1932) and C M Wigg (1889-1969) still grace walls of many homes, depicting beautiful scenes of the Broads in times gone by and – in the case of Leonard Squirrell (1893-1979) – many of East Anglia’s attractive towns and villages. 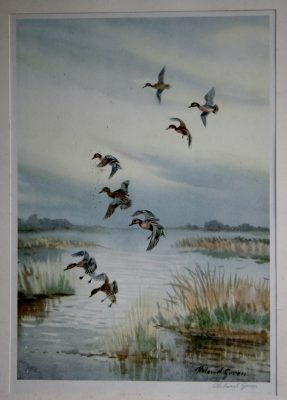 We are not only graced with a beautiful landscape which still draws artists from far and wide, we have abundant bird and other wildlife which has not escaped the notice of some of the country’s leading bird artists; JC Harrison and Rowland Green can hold their own in this field along with many of the greats. And so we have to be grateful to our forefathers who started this regional artistic excellence and fought so hard to preserve and encourage it. The Antiques Fair at Dunston Hall always has a selection of paintings (pre-dating 1940) by local artists. Please pop along to the next fair to see!